Take the following news with a grain of salt. 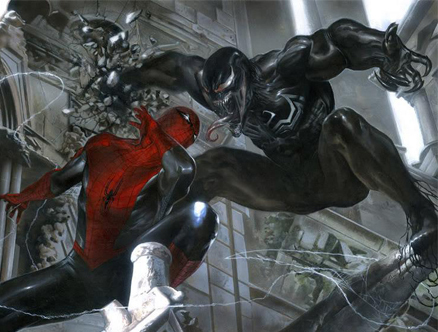 We know that shooting for The Amazing Spider-Man 2 began earlier this week, and for the most part, we know who the major players are going to be. Andrew Garfield is set to return as Spidey along with Emma Stone as Gwen Stacy. The villains joining the cast this time out will be Jamie Foxx as Electro and Paul Giamatti as the Rhino (rumored). But, if a picture yesterday from the set is any indication, there could be another major villain entering the fold. The above picture, tweeted by Marc Webb , may just seem like a normal photo of a locker, but fans of Ultimate Spider-Man know better. The picture resembles the one below from the comics. In that storyline, Peter Parker discovers the Venom experiment in a locker, which just so happens to be the same number: 14. If we’re right (again, if Marc Webb isn’t just screwing with us), then Dane DeHaan would be the new Venom. And that makes a lot of sense, doesn’t it? The son of the Green Goblin, friends with Peter Parker, who will eventually turn on the hero. With his roots in OsCorp and his best friend Spider-Man destined to turn against Harry’s father, Dane DeHaan seems like the perfect candidate for the Venom suit in the new franchise, and then get his own solo movie, courtesy of DeHaan’s old Chronicle director, Josh Trank. I would personally be thrilled to see Venom make a comeback in the sequel. As I said earlier in the week, it’s about time Venom gets his day on the silver screen. The character was completely forgotten about and destroyed in Spider-Man 3, and doing a Spidey movie without Venom–arguably his biggest nemesis–is like doing a Batman film series without the Joker. I’m hoping these rumors are true, but with all the villains in the sequel already, will Venom be another forgotten character, or is Columbia Pictures setting him up for his own standalone film, something they’ve been looking to do? This locker scene could come at the end of the film, setting the stage for Venom and Spider-Man to face off in the third, and presumably final, film in Webb’s trilogy. Only time will tell, but I’m on board with the idea.